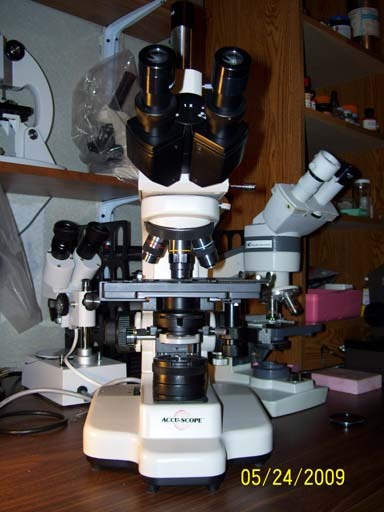 Ten years ago I bought the Accuscope 3016 microscope. These microscopes are made in China so I was a little worried about the quality, because I had bad experiences with Chinese made machine tools. But times have changed since then all the big microscope manufacturers have some models made in China, including Zeiss. These microscopes are still being sold. Siedentopf head 30 degrees incline. Modern stand with low controls. The condenser has an easy centering device. Koehler type illuminator with aspheric lens and iris diaphragm. When I received the microscope, I was amazed at how heavy it is. All controls work smoothly and precisely. A good feeling. I have a Zeiss KF 2 with standard Zeiss optics. I compared the Accuscope's performance with the Zeiss. I could see no difference in resolution and contrast. Par centering and par focus is very good. I bought it with the standard achromats, which give a reasonable flat field. A lot flatter than my Lomo, but that is not important to me. The field is, under all powers, evenly illuminated when observing visually. 2) There is no filter holder under the condenser. Since I like to play with illumination tricks, like, darkfield , oblique, Rheinberg etc., that was unacceptable. I made my own filter holder and screwed it to the condenser. In the picture, the white plastic part under the condenser is my home made filter holder. 3) The 10X objective has only a working distance of about 2mm. I could not live with that, because I like to observe aquatic organisms, using well slides. I called the dealer and inquired about the working distance of the 10X Plan objective. So I ordered it. It has a more acceptable working distance. There went another $100,-. The fact that it has infinity corrected objectives intrigued me most, but now I wonder why I wanted it. This is good to have when for some reason the tube length has to change, like adding an epi illuminator etc. Out of curiosity, I put one of those objectives into my American Optical microscope to see if they work there. They do work. I checked it with my test slide. So they are really infinity corrected. I like this microscope, especially after I fixed it up the way I wanted it. It is not a research microscope (it is advertised as "Koehler type" not Koehler), but it performs well and is pleasant to use. It is a quality instrument. Visually, I could not detect any inferiority to any other microscope I possess. That includes Lomo, full Koehler Swift, Zeiss KF2 and an AO 150. Would I buy it again? Maybe not. My junky Lomo with its Koehler illuminator and Apo objectives is still my favorite. Comments to the author Bill Resch are welcomed. Editor's footnote. One or more permanently installed diffusers seem increasingly the norm in microscopes by all makers in recent decades, e.g. the Nikon Labophot, Leitz Diaplan research stand, current research models like the Leica DM LB. In some older stands the diffusers were present but could optionally be swung out of the way, e.g. on the Zeiss Photomicroscope III. Published in the June 2009 edition of Micscape.